Night On The Town – When you book a 5 hour night on the, town, you will get the 6th hour free!. Wedding Transportation - If you book a wedding transportation between now and January 1st for the upcoming 2012 year, we will give you a 10% discount and also throw in an extra bottle of champagne on top of what you alreadyreceived from us. 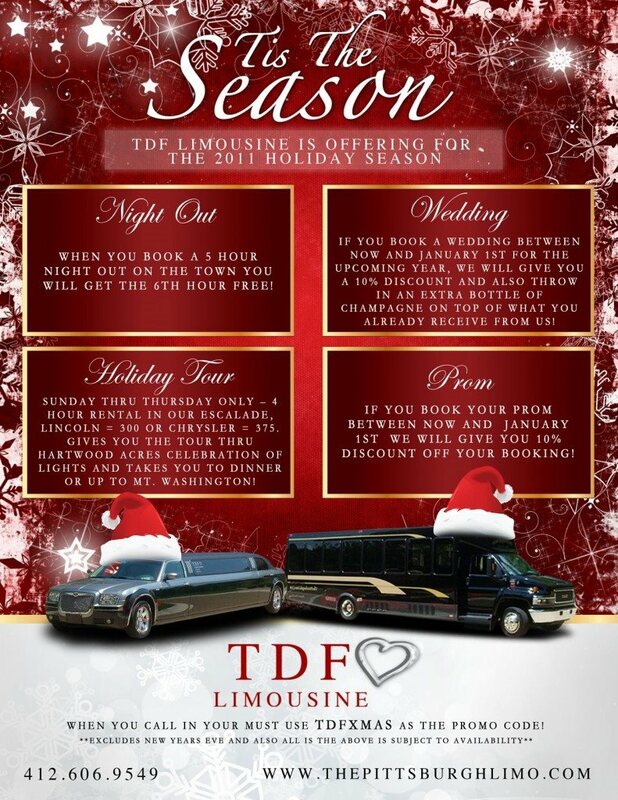 2011 Holiday Tour – Sunday thru Thursday Only! 4 hour limousine rental in our Escalade, Lincoln 300 or Chrysler 375. This 2011 Holiday Tour package gives you the tour thru Hartwood Acres Celebration of Lights and to dinner or up to Mt. Washington. Prom Limo Special – If you book your prom limo between now and January 1st, get 10% discount off your rental!